“Niner” weighed 235 pounds, sported a 21 ½ inch inside spread and was five years old. My heart raced as my brain tried to process what had just happened! One second I was looking down an empty shooting lane through planted pines, the next I was scrambling to shoulder my rifle and get the crosshairs on a buck crossing the lane. Now the lane was empty again and the shot echoed through the timber. The whole thing took five seconds or less but the process of getting to this point had taken seventeen years! deer and ugly because it is just hard to look at. In 1935 President Franklin D. Roosevelt’s “Civilian Conservation Corp” initiated a seven- year tree planting program that resulted in millions of acres planted into trees. 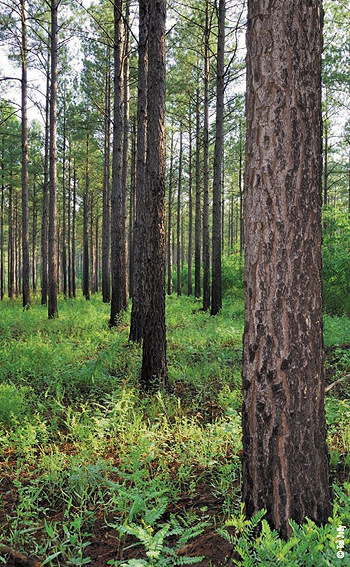 Between the years 1975 and 1997 the federally funded “Forest Incentives Program” and the “Conservation Reserve Program” inspired the planting of nearly fifty million acres of marginal timber and farm land to pines and hardwoods. Today there are four million acres of trees planted in northern states, 38 million acres in the south and fourteen million acres in the west. Our farm is in the south; east-central Alabama to be specific. 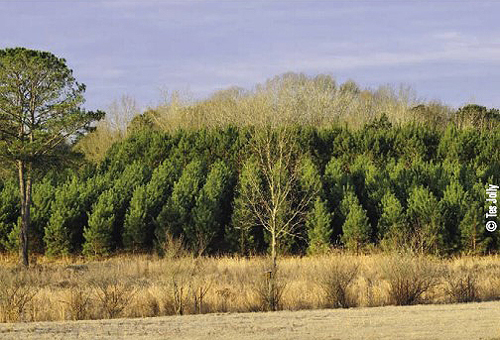 Like most farms in Alabama and especially around us, planted pine plantations occupy part of our acreage. In 1995 Tes and her Dad, Ned, planted 20 acres of pasture land to pines. The idea was to provide habitat attractive to deer and grow a cash crop at the same time. When Tes and I married in 1996 that 20 acre pine plantation was well on its way to becoming a deer magnet. Briars, sedge grass and other vegetation had emerged and between the planted pines and a hardwood drain. The next day Ned arrowed a handsome three year old eight point after he emerged from the pines and made his way past the stand. Ned was 82 years old! 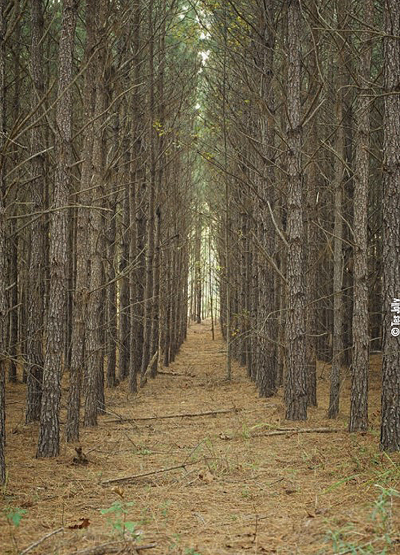 Over the next four years the pine plantation remained a constant for deer bedding. It had become a vital part of our management program but the pendulum had begun to swing in another direction. The pines were winning the war over the understory which was vital for deer bedding security. With that in mind we planted an additional ten acres of pines in the interior of the farm. Two years later, in 2003, we planted ten more acres. There are three stages in the pine plantation management cycle. The duration of these stages varies with soil type, site preparation and whether or not you fertilize the seedlings. The transition from bad to good or good to bad is gradual. The transition from bad to ugly is abrupt! Pine seedlings are typically planted during the winter in the south and the spring in the north. Each of our three plantings occurred during February. The land planted was pasture land seeded with Bahia grass. Our goal was to create bedding for deer so we used a chisel plow to lightly break the ground between the rows of trees to release the natural seed bank. This speeds the process of natural vegetation germination and growth. The first management stage lasts two years. I rate this first stage as bad and ugly. Bad because there is not enough cover to hold deer and ugly because it is just hard to look at. the center of our farm. The second stage is where things get good! The seedlings grow limbs from the trunk that begin near the ground and reach near the crown. As the seedling grows in height the limbs grow in length, gradually closing the space between the rows. Natural vegetation in the seed bank released by the plow sprouts and spreads. At the end of the third year the plantation is almost impenetrable. To enhance this process we spread 150 pounds of triple 13 fertilizer per acre in March prior to the second growing season. This application increases plant and seedling growth and increases palpability of the natural forage. This “good” stage typically lasts five or six years before the pines close the canopy and starve the natural vegetation of vital sunlight. By the time the trees are twelve years old, the plantation has become a biological desert. Practically all the natural vegetation has been strangled out of the plantation and deer no longer have attractive browse or cover for bedding. In 2008, assisted by Alabama Forest Commission personnel and forester Andy Guy, we did a prescribed burn to reduce the fuel load under the pines. This is the “Bad” stage and it lasts until after thinning. In our case, we decided to thin the first pine plantation in 2010. The trees were fifteen years old. After thinning, the plantation returns to the “Ugly” stage, but it can be short-lived if handled correctly. We consulted John Richardson’s “Little Tallapoosa Timber Company” to achieve the results we wanted. Small tracts require coordination and preplanning so research timber companies that are agreeable to cut with habitat and wildlife management goals in mind. attractive browse or cover for bedding. Our goal was to get deer using and bedding in the plantation as soon as possible. Richardson suggested we remove approximately 50% of the original stand with the first thinning. That tactic eliminated the customary second thinning but the results were dramatic. Extra care was given to protect trees not cut and to eliminating as much debris as possible. This extra care keeps the “Ugly” stage from getting “really ugly.” Richardson realized we were not in the timber business and worked with us to create deer habitat as quickly as possible with as little impact on surrounding areas as possible. The shooting lane mentioned at the beginning of this story was strategically located at a pinch point where the pines met a hardwood drain. One central area was chosen for trimming and loading harvested trees. In time this 1.5 acre site will become a food plot. One year after the thinning was complete the “ugly” phase had transformed to “good”. Dog fennel, sedge grass, beauty berry and briars had made a dramatic return. Deer were bedding and browsing in the plantation again. If there is one thing we have learned from being gamekeepers, it would be that nothing good happens quickly. It takes time for Mother Nature to do her work. This is especially true with growing timber and timber manipulation. The three pine plantings on our farm form two plantations. The oldest plantation is 20 acres and is broken by two small hardwood drains. The second plantation is comprised of the trees planted in 2001 and 2003. Between the plantations is open pasture dotted with oaks and large native pine trees. The closest distance between the plantations is 300 yards along a natural draw between two ridges. In the spring of 2006 I plowed the draw to release the natural seed bank. Today we call that area Ned’s Brushy Draw in memory of Tes’ Dad. Briars, sedge grass, honeysuckle, pine saplings and dog fennel dominate. In 2008 I mowed two twenty foot-wide viewing lanes across the draw. I then mowed ten strips the length of the draw. Each year I mow ten more lanes. The idea is to keep the pine, oak and gum seedlings from forming a canopy that will strangle out the briars, honeysuckle and dog fennel. The Brushy Draw is a deer highway through the center of our farm. 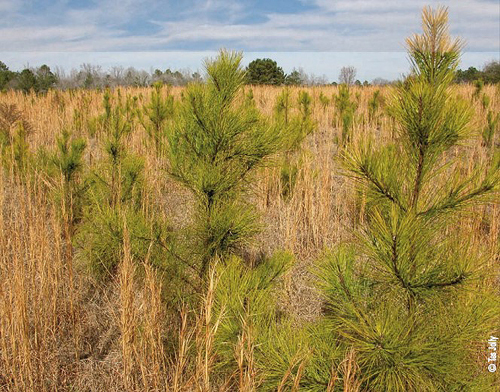 In February of 2014 we plan to plant another small pine plantation that will connect with the original 20 acre planting. We also plan to thin the second planting. When these two projects are complete we will have connected the dots. Deer will have bedding and a travel corridor through the center of our property that will last for years. summer the natural vegetation was on its way back. In December, 2010 a trail camera took one picture of an interesting nine point buck on the edge of one of the hardwood drains in the original pine plantation. Tes and I estimated he was three years old at that time. In December, 2011 we got one more photo of that buck. He was a little heavier but his rack was virtually the same. We named him Niner for his nine point rack and put him on our hit list. We never saw him and only had two pictures of him over that two year period. In 20122 things changed with Niner. He appeared nightly at a feeder set near the pines throughout the summer and early fall. It was apparent early on that he had become a real trophy for our part of Alabama. During late September I set a hang-on stand in a pine tree on the edge of the shooting lane in the pine plantation. That stand was only a few yards from the tree where Ned shot his first buck with a bow in 1997. The natural pinch point between the pines and the food plot planted in BioLogic Outfitters Blend were perfect for a bow stand. In late October while hanging another treestand, I tore the rotator cuff in my right shoulder. That was the end of my bowhunting for 2012. Surgery to repair the tear was done on December 18. On December 28 I could not sit in the house any longer. I grabbed my rifle and headed to the shooting house that allowed me to watch the food plot and the shooting lane in the pines. At 4:50 Niner stepped into the lane. After the text message from Tes I walked to where the buck had crossed the shooting lane. He was laying 20 yards from where I last saw him. I could not believe my good fortune. When she arrived I was still admiring the buck. 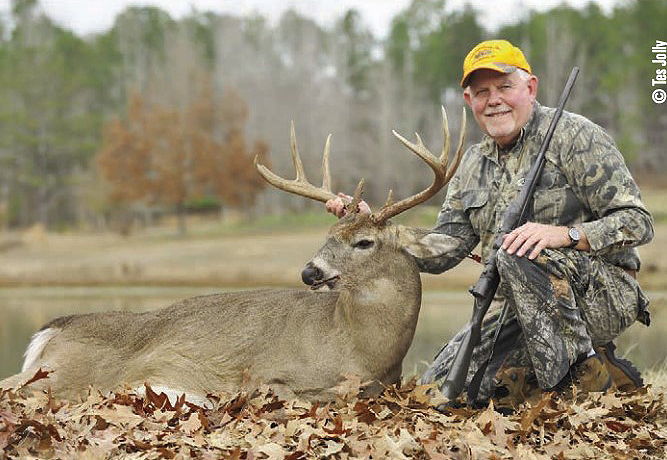 We discussed the mixed emotions that we always feel when one of our hit-list bucks is killed. We hugged and said a prayer of thanks for the opportunities we have and the many joys that come to us as gamekeepers. There was no way we could load that buck on the HuntVe without help. In the end, we hooked to a small trailer and were able to drag him onto it. At the skinning shed the scales read 235 pounds. The tape read 21 and ½ inches for an inside spread. Later his jawbone confirmed he was five years old. Seventeen years after the first pine tree was planted on the Randle Farm it had all come full circle! Did I mention that you cannot rush Mother Nature? You’ve got to do something different than the other duck hunters are doing. 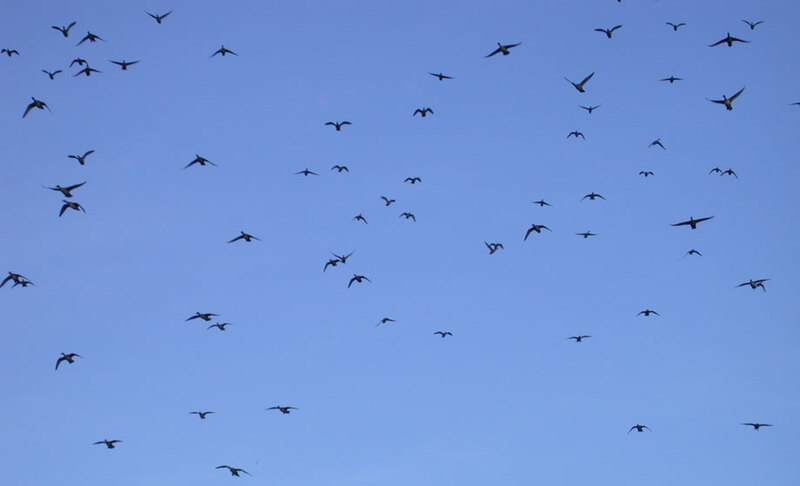 If you want to bag your birds, setting up your blind 60 yards downwind of your decoy spread and pass-shooting the ducks is something different than most hunters ever will do. 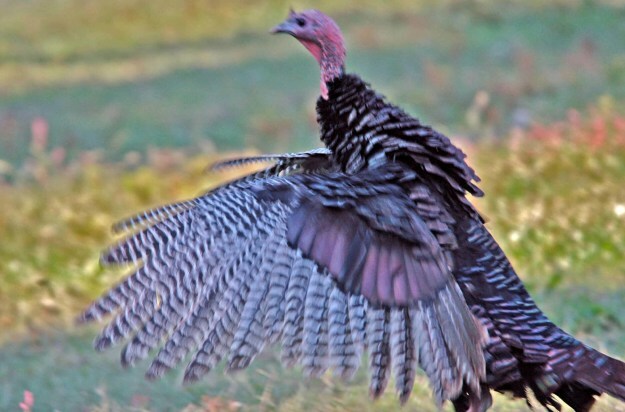 Until we can get inside a tom’s brain and read his mind, all we know is that this gobbler, for some reason, flew over the pine top. The gobbler looked down in the pine top to see what was there, but he didn’t see me because of my Mossy Oak camouflage.